The Au Sable River is Michigan’s most known trout stream, and is know throughout the region as one of the best streams. 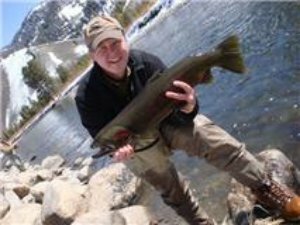 The last few miles of its lower section of this popular river, below Foote Dam, not only have good trout fishing, but it also has great Steelhead runs. The river starts north of Grayling and runs about 100 miles to Lake Huron. This river runs parallel to the Manistee River for about 12 miles until they split off and go towards Lake Huron and Lake Michigan. The fly’s only section starts at Burtons landing and remains for 9 miles until it reaches Wakeley Bridge. This section of fly’s only area is also called “Holy Water” since it is a fly-fishermen’s paradise. The river is easy to wade and it has nice gravel, riffles and pools to go along with great hatches. You can access this great stream at Thendara Road and Stephan Bridge to name a few. There is more good fishing below Wakeley Bridge all the way to Mio pond. There are more deep pools in this section. Below Mio pond is more great fishing all the way to Mckinley Bridge. You can access this section at a few locations including Parmalee Bridge and Cherry Creek Road. This section produces some of the biggest Browns and Rainbows each year. This area is not as easy to wade as the "holy water" but it does hold some very big fish. This is a nice stream that has some very great hatches and many nice size trout ready to be hooked. This stream has a great Hex hatch that the trout seem to love. The lower section below Foote Dam is where the Steelhead run. This section is not very wadable and you should use a boat to fish this section. There are plenty of local guides that can assist you with a great fishing trip! 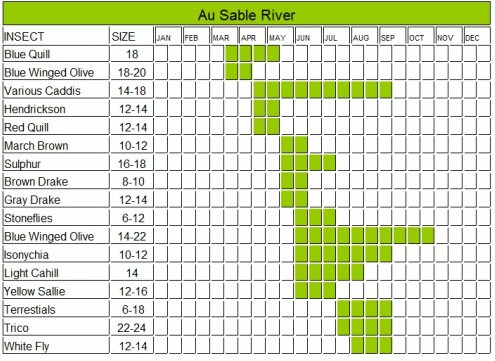 If you can only fish one river in Michigan make it the Au Sable River, but be sure to fish the whole river. The good fishing does not let up, and it will always bring you back for more. Be sure to check out the North and South branches of this river also, because the fly fishing can be equally amazing on those streams. Click here to see the Google map of the river area. Click here to leave the Au Sable River and return to Michigan home page.